Emily became the second Mrs. Weddall on April 27th 1905. 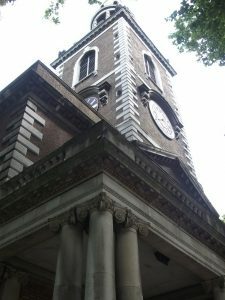 She and her new husband Captain Edward Weddall were married in St. Mary’s Church Islington, London. Unlike modern or society weddings of the day theirs was a simple affair. They exchanged vows without friend or family present, with just two witnesses one which was the church clerk. Emily and Edward were married by licence, which meant in their case they were not “of the parish”. Emily gave the address of Waverly Terrace, Rathgar in Dublin, Edward gave a Yorkshire address. They had to get permission from a bishop to get married. The other advantages to the marriage licence they could get married quicker than if they opted for the marriage banns which had to be read out in church at least three weeks beforehand. As the bride and groom did not have friends or family present the still put the announcement in their local newspapers, the Beverley and East-Riding Recorder and the Irish Weekly Times. This practice was common at the time, but also a good way of letting the wider world know of their exchange of vows. This entry was posted in Family, History, Places on November 11, 2017 by Maria.